If you're a dog lover you'll have a blast playing this game; if you don't have a dog, you'll get to be one in the game A Dog's Life. The unique board game has beautiful illustrations and a fun themed board that goes hand in hand with the creative game play. You'll need to try and find three dog bones and burry them to become the winner but doing so will, at times, is a little more challenging than it sounds. Great for the whole family, A Dog's Life is as much education as it is fun as you learn more about an actual dog's life, its habits and its strengths. Learning how to play is quick and easy thanks to the wonderfully put together game rules with examples and helpful pictures. This game is on presale so keep an eye on this when it comes out. It definitely won't be one you want to miss. Review Completed (2017-05-21) Our overall experience and impression of A Dog's life, from the unboxing to the quality of build, how the rules were written and ultimately to the logic of the game play, we have little to say but "Wow, what a great game!" A Dog's life is wonderfully illustrated with a lot of nice hidden dog references all throughout the board (such as signs and building being made out of dog bones). The build quality of the game board, pieces, playing cards and even the user tokens (figurines of different dogs) is superb. Much better than cheap games you find at big box stores. It all fits nicely in a sturdy storage box with fun reflective ink. First thing we saw when pulling the lid off was a nice rule book sitting there. After picking it up you realize this is a miniature book with multiple pages. Depending on the version you get you could have upwards to 12 pages or more. Seems daunting but when you open it up you find lots of illustrations, explanations and examples – thank you for the examples! Much detail was given to making things as clear as possible while keeping things as short and simple as they could. It took us about 15 minutes to go through the rules. At the end, we weren't confused or overwhelmed (like sometimes we have been with other games) but rather excited and ready to play the game. The rules walk you through the game play explaining things on the way which helps to not overload your brain. We did notice that there are different variations of the game that you can incorporate although we have not tried them yet. The best thing about a board game is, when you're finished, you want to play again and again. This game is no different. There is plenty of strategy, options, twists and turns and just enough luck that it truly is a fun and unique experience. Players will advance through the game board roaming around the streets in search of food (either by begging for it in a restaurant or digging in a trash can), trying to stay hydrated (and even deciding where they need to piddle), attempting to find bones by correctly delivering newspapers and even have an occasional fight with another dog. The strategy comes in as you try to block other players, take away what they have in their mouths and avoid the dreaded dog catcher (although you'll have a chance to drive the dog catcher’s van in hunt for your opponents). There is a lot you can do on each of your turns so there is a fair amount to keep track of. After a few rounds you get accustomed to it fairly quickly and it becomes second nature. This could be seen as a draw back to some players; there is always a learning curve. While we listed one small criticism we might as well add a couple more. The player game pieces, different breeds of dogs, are such cute detailed figurines that they seem almost too nice to play with. Some even have very small or sharp points making us wonder how well they will hold up before an ear, tongue or tail gets ripped off – time will tell. Also, the different markers are small and understandably so; there is a lot going on on the game board so they must all fit. The draw back is that things get really busy, slightly cluttered and a little tricky to make sense of the board when in full pursuit of victory. Not big deal breakers and something that just comes with the territory. There is also a collector's edition available (perhaps for a limited time) that gives you 25 different dogs. If you are a dog owner, there is no better game than this one. If you have ever seen a dog, you'll enjoy playing this game as you step inside a dog's life and deal with their simple daily challenges. 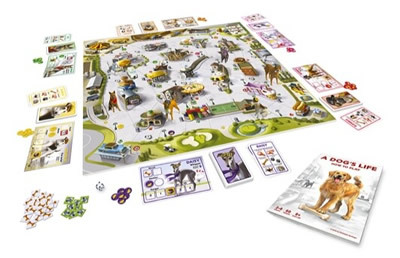 A Dog's Life is a nice, lighthearted, intriguing, unique and stimulating board game for the whole family. If you can successfully find and burry three different dog bones in your den then you will be the winner. 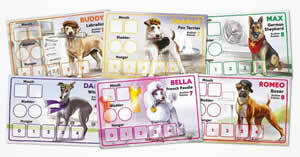 A Dog's Life will include a game board, 6 dog figures, a dog catcher’s car, 1 die, 6 dog cards, 72 action cards, 6 den cards, 6 hunger counters, 15 trash can counters, 24 bones, 12 newspapers, 48 piddle counters and the official A Dog's Life game rules and instructions. 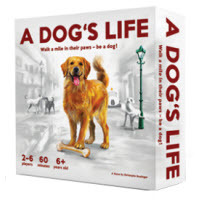 Please keep in mind that the official A Dog's Life board game rules and instructions could be different depending on the game version you have. The rules below are some of the exact directions on how to play A Dog's Life. Share with us your comments, funny stories, tips, advice, strategies, creative ways to play, questions about how to play, problems with the rules or anything you want about A Dog's Life. All submissions will be reviewed within 24 hours. Click here to add your A Dog's Life comments. A friend told me about this game (don't know how she knew since it's not even out yet) but after looking through the game rules this looks so fun!! I can't wait for it (and yes I'm a dog lover).